Read it at The Local. 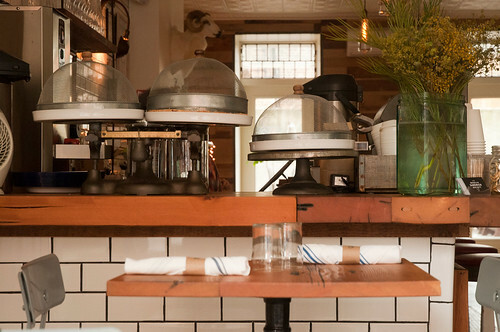 How do you make a local, seasonal, farm-to-table restaurant concept unpretentious? Andres Valbuena and Melissa Gorman, owners of the newly opened Brooklyn Sandwich Society restaurant, got practice by hosting hundreds of strangers in several Brooklyn apartments for three years. Ms. Gorman was a gastronome and Mr. Valbuena was a retiring chef, when they met on the dance floor of the Santos Party House in downtown Manhattan five years ago. Mr. Valbuena had worked at high-end restaurants such as Mugaritz and The French Laundry, but wanted to leave restaurant work, which he found stressful and repetitive. At the time they met he was recovering from an injury which had him sidelined from cooking and contemplating leaving the business altogether. “He swore up and down to me he would never open a restaurant,” Ms. Gorman said. But less than one year later he was back in the kitchen after the couple started a monthly supper club, serving friends, then strangers, out of Mr. Valbuena’s apartment in Prospect-Lefferts Gardens. As word spread, they hosted dinners more frequently, up to four times a month, and moved the venue to Bedford-Stuyvesant. Eventually they realized they needed to expand beyond dinner parties, opening the Brooklyn Sandwich Society at 184 DeKalb Avenue on Oct. 8, to offer creative takes on staple dishes because “it’s a much more accessible way to eat,” said Ms. Gorman. In the three months since opening, the Society has expanded from a dinner-only offering of eight sandwiches and six small plates, to serve full lunch, dinner and weekend brunch menus. The menu is seasonal – so seasonal, in fact, that the sandwich we had on our first visit last week, a piquant eggplant-and-watercress concoction, has since been shelved to make room for more wintry options. Current mainstays include the Cumberland, a sandwich of pork belly and pickled carrots, and the Myrtle, a veritable mound of beef brisket with aged Bloomsday cheese, sauerkraut and horseradish aioli. “That sandwich is like candy,” Mr. Valbuena said. Smoked-ricotta gnocchi are a more recent addition, as is a large Rohan duck meatball served over whipped potatoes. Rohan duck, Mr. Valbuena explained, is a cross between the rich-fleshed Mallard duck and the leaner Peking, which is butchered onsite. “If we had the space, we’d be butchering bigger animals,” Ms. Gorman said. Ms. Gorman and Mr. Valbuena source their ingredients, as much as possible, from like-minded, like-sized local producers. Fried bread from Roberta’s makes an appearance in their restaurant. The Society’s gluten-free bread comes from another small supplier — so small that, besides the sandwich shop, the baker only sells the bread at Smorgasborg, the Brooklyn Flea’s weekend food fair in Williamsburg. 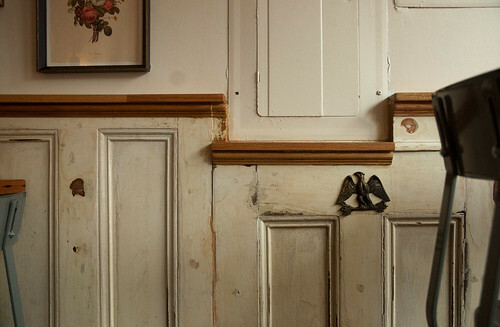 Their mission to source locally extends to the space itself, much of which the couple remodeled over four months in 2012 with the help of salvaged materials and Brooklyn Navy Yard cabinet-maker Jon Besch. Four long tables in the restaurant — seating six or more diners — have waist-high legs made from recovered antique lathes (one of which came from Connecticut, the other from Pennsylvania). The lathe tops have been turned into three long shelves behind the bar that hold wine bottles, glassware and large jars of tea. Antique door panels from Eddie’s Swap Shop line the bottom half of the restaurant walls, and the lights above the bar are made of milk bottles from the now-closed Milk Thistle Farm. Ms. Gorman and Mr. Valbuena collected salvaged furniture for more than a year before the restaurant opened, and stored the items in their apartment. The couple now live a fifteen-minute walk away from the restaurant — convenient for working fourteen-hour days, six days a week. Luckily, they still have time to run some errands. “Monday is when we get to do our laundry,” Ms. Gorman said. The restaurant’s name has caused some confusion from patrons who expect nothing but sandwiches, said Ms. Gorman. But the pair appreciates the chance to introduce diners to new ingredients, such as a simple salad of heirloom radishes, cultured butter and salt, or the recently added Wagyu beef rillette, which sells out regularly. But even at dinner, one sandwich is always offered. 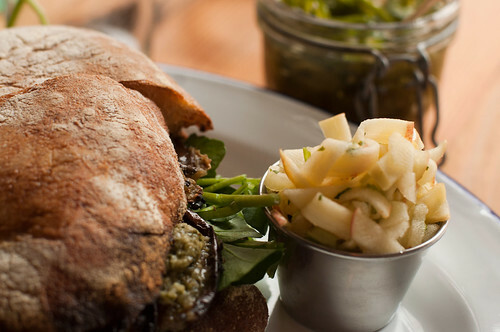 “If you don’t want to have a beef tongue rillette, you can still have a brisket sandwich,”Ms. Gorman said. One woman was inspired by the restaurant’s use of sunchokes — also known as Jerusalem artichokes — to try to cook the root vegetables at home. The day after Thanksgiving, she came in, saying “I screwed it up” to Mr. Valbuena. But he calmly showed her how to salvage the recipe by adding a bit of cream and turning it into a soup. The pair has an expansive vision, hoping to someday operate several restaurants and a retail store, such as Marlowe and Sons. 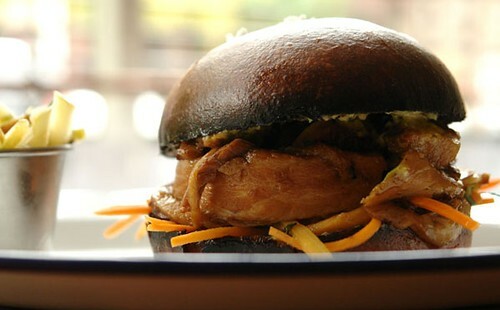 For now, the Sandwich Society is open six days a week, with constantly changing dishes. Hours at the Brooklyn Sandwich Society vary. Tuesday through Friday you can have lunch from 11 a.m. to 4 p.m. and dinner between 5:30 and 11 p.m. Friday and Saturdays dinner hours are extended by an hour. Sunday dinner hours end at 10 p.m. Saturdays and Sundays you can catch a quick brunch between 11 a.m. and 4 p.m. Most plates cost between $7 and $29.